Bulgari watches blend Italian chic with Swiss quality. Precious gemstones, unique designs, high-tech materials, and in-house calibers are the cornerstones of success for this brand. Actors Liz Taylor and Clark Gable were well-known Bulgari wearers. This company is one of the most well-known luxury brands worldwide. Bulgari offers nine different watch collections for men and women. Although headquartered in Rome, their watch division is located in the canton of Neuchâtel, the center of Swiss watchmaking. They have been producing high-quality timepieces in this area since 1980. However, the company isn't just known for their watches; they're also known for jewelry, perfumes, accessories, and boutiques. The large, decorative inscription BVLGARI on the bezel of many of the watches immediately catches the eye. The unique spelling of Bulgari can be traced back to company founder Sotirio Bulgari. He used the Latin letter "V" in the company's sign when he reopened his large store in Rome in 1934 after renovations. This peculiar orthography has been kept to this day and has since become a characteristic mark of the brand. 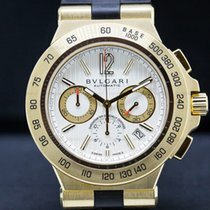 Bulgari integrated their name into their watch designs for the first time in 1977 with the Bvlgari Bvlgari collection, which is still available today. The engraved BVLGARI BVLGARI logo appears twice on the bezel, surrounding the dial. There are also particularly luxurious versions of this watch in the series, such as a men's watch in rose gold with a tourbillon and sapphire bridge. The watch is powered by the in-house caliber BVL 263, which has a power reserve of 60 hours. Movements with tourbillons such as this one compensate for the influence of gravity on the balance wheel and are therefore considered especially accurate, but also complex and difficult to manufacture. One version of the watch features more than 400 diamonds on its case and dial, raising its value. The Octo collection's octagonal dial and bezel are its most distinctive qualities. The watches in this collection are not just unique because of their shape, though. The Octo Saltarello is a jumping hour watch, meaning it displays the hour as a number in a window similar to a date display window. The minute hand also functions in a unique way. It doesn't rotate in a full circle, but rather displays the minutes on a semi-circle scale from 0 to 60 similar to a car's speedometer. The date is also displayed in a similar manner, with a hand and scale from 1 to 31. The caliber BVL 328 powers the Octo Velocissimo ("very fast"), and the movement is unusually fast. At 36,000 A/h, it runs considerably faster than usual mechanical watch movements, which normally run at 21,600 A/h or 28,000 A/h. TAG Heuer is another manufacturer quite well known for these so-called high-speed oscillators. These types of watches allow for very exact time measurement. Therefore, it's no surprise that they're often constructed as chronographs, like the Velocissimo, which runs at 5 Hz. The Maserati edition features a tachymetric scale on the bezel, which can be used in combination with the stopwatch function to determine the kilometers per hour on a particular route. The Octo Velocissimo also has a high-tech anchor escapement made of silicon, a hard material that requires little lubrication and is not influenced by magnetic fields. The Octo Finissimo ("very thin") lives up to its name with an impressively thin movement. Even with a tourbillon, the 1.95-mm thick movement is thinner than a Swiss five franc coin. Bulgari is one of the few manufacturers that develop and manufacture their movements completely independently. Industry experts consider these so-called manufacture movements as a sign of exclusivity. The Finissimo's case is available in rose gold or platinum, with its surfaces partly polished and partly satin-finished. The Magnesium, introduced as a part of the Diagono collection in 2015, is a particularly innovative watch. It has a ceramic bezel but is otherwise made of unique materials. Bulgari uses magnesium for the case because it is particularly lightweight and durable, even more so than titanium. They also utilize a special heat-resistant polymer, PEEK (polyether ether ketone), which is used in the aviation and aerospace industries. Watches from this series are sporty, robust, and waterproof to 100 m. The diving watch Diagono Scuba is even more impressive: It is waterproof up to 300 m. The Italian manufacturer Panerai offers diving watches that are similar to the Scuba. The Diagono collection is made up of three-hand watches with central second registers and chronographs. Like the Octo, Bulgari also offers a version of the Velocissimo with the caliber BVL 328. Bulgari acquired the watchmaking company Daniel Roth in 2000. The watch series from this subsidiary contains innovative works of art. Skeletonized watches, movements with tourbillons and chimes, decorative diamonds, and unusual dials characterize the watches in this series. A Daniel Roth would appeal to a wearer fascinated by a complicated Breguet. In the world of women's watches, the Serpenti straddles the boundary of jewelry and watch. The stylized snake is covered in diamonds and other jewels, depending on the version, and is worn as a bracelet. The quartz-powered watch is located in the snake's head. The Serpenti is the most prominent women's collection, but certainly not the only. Collections such as the Diagono and the Bulgari Bulgari include both men's and women's watches. Bulgari was known to appeal to both male and female celebrities staying in Rome while filming at the famous film studio Cinecittà. Major Hollywood stars such as Marlene Dietrich, Audrey Hepburn, and Gary Cooper all wore Bulgari. But it's not just the stars of yesteryear: Oscar winner Adrien Brody wears a Bulgari Octo Finissimo. The roots of this business go all the way back to Epirus, a region in Greece. Sotirios Voulgaris (1857-1932) worked as a silversmith in the small village of Paramythia. The house where his first workshop was located still exists today. In 1877, Voulgaris relocated to the Greek island of Corfu, and in 1881, he left Greece for Italy. He finally settled down in Rome, changed his name to Sotirio Bulgari, and opened several jewelry and antique stores. The store he opened in 1905 at Via Condotti 10 later became the flagship store and remains so today. Bulgari's grandchildren developed the company into a worldwide brand during the 1980s. They went public in 1995 and now have branches all around the world. The family owned the majority of shares of the company until 2011, at which point the French luxury concern Moët Hennessy Louis Vuitton took over. The watches from Bulgari combine stylish Italian designs and Swiss precision. Light metals, as well as the most modern synthetic materials used in space travel, are utilized in these timepieces. Bulgari is an elite player in watchmaking, seeing as they manufacture their own calibers. At the same time, thanks to their precious metals and decorative jewels, the watches are more than just timekeepers: They meet the desire for luxury and aesthetics.